In an age when most of us are searching for a way to slim down, some of us are still hoping to plump up--our lips, that is. Since I'm not exactly considering a trip to the plastic surgeon's office, Angelina Jolie's perfect pout is pretty much beyond my reach. I found I can come close, however, with a little help from glominerals (www.gloskincare.com). The company's gloLip plumper ($16), a unique plumping formula infused with spheres of Marine Collagen Atelocolalgen which trap water and swell to provide volume, is designed to do the trick. Capsicum Extract, which comes from peppers, stimulates lips (not sure how I feel about the tingling sensation but it's pretty mild) and safflower oil softens and conditions (just in time for Valentine's Day). Choose your hue--copper shimmer, sheer berry or natural, or soon-to-be-released plum and cherry--and get ready to pucker up! So your life has been pretty stressful lately--too many important meetings to prepare for, late nights to recover from and emotional antics that really take their toll. The worst part is that more often than not, it all shows up on your face. If only there was a magic wand that could erase the damage. Introducing The Eraser ($19), a great new tool from Tarte Cosmetics. 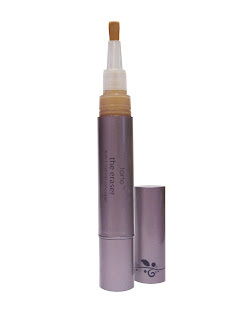 It's a 4-in-1 natural concealer that comes in ten shades to suit any skin color. Just swipe it under eyes day or night to send dark circles, blemishes and puffy eyes packing. The silicone and water based formula keeps skin hydrated and prevents creasing and caking. And a handful of hydrating, antioxidant-based ingredients like safflower seed oil, cucumber extract, vitamins C and E, and olive oil keep skin looking soft, smooth and brightened. I'm always wary of concealers that leave skin looking worse than it does naturally...but this one sounded so appealing, I couldn't wait to try it. Now I know why Mary Louise-Parker looked so great at the Golden Globes! Just twist the product up into the wand then brush it on. It absorbed easily and blended well with my skin tone. My skin felt soft and smooth--leaving me with nothing to hide! Check out www.tartecosmetics.com.